At first, the horrifically hilarious musical remake wasn't a huge hit. Since then, you might say it has grown on people. 1. IT CAN BE TRACED BACK TO A BET. The Little Shop of Horrors (1960) has been called “the best film that was ever shot in two days.” Strictly speaking, this isn’t entirely true. According to some accounts, the project was born when director Roger Corman—who had a knack for making cult classics on the cheap—bet his brother, Gene, that he could rehearse and shoot an entire film during the last week of 1959. Using leftover sets from an earlier movie, Corman spent Monday through Wednesday going through the motions with his actors before shooting on Thursday and Friday. Most sources end the story right here. What generally goes unreported is the fact that Corman called his cast back for re-shoots and new sequences over the next two weekends. The Little Shop of Horrors was also one Jack Nicholson’s earliest roles (he plays a masochistic dental patient). This future star later reminisced about the film’s tight budget, saying that Corman wouldn’t even pay to make copies of the script. After its release, the picture became a popular title on late-night telecasts. It also inspired a hit off-Broadway show. Premiering on May 6, 1982, the original production ran for a month, until it got picked up by a producer and began an impressive 2209-performance run over the next five years, making it, at the time, the highest-grossing off-Broadway production ever. The $25 million film adaptation of the musical hit theaters in 1986. 2. THE BIGGEST PLANT PUPPET REQUIRED UP TO 60 TECHNICIANS TO OPERATE. If Little Shop of Horrors was green-lit today, its leafy, extraterrestrial villain would probably be computer-animated. Back in the mid-1980s, though, this technology hadn’t yet come of age. Fortunately, the movie’s director, Frank Oz, knew puppetry inside and out. A key collaborator of Jim Henson's, Oz had spent 10 years voicing Fozzie Bear, Miss Piggy, and others before he was hired to helm Little Shop of Horrors. Oz's biggest challenge was creating the plant itself. Named Audrey II, it not only grows from a sapling to a giant over the course of the film, but it also sings, shimmies, and eats people alive. Technicians built six animatronic flytraps of varying sizes for the film. The smallest was a mere 4 inches tall and the largest stood over 12 feet in height. Used toward the climax of the movie, it required as many as 60 human operators. 3. ONE SONG FORESHADOWED ARIEL'S BIG SHOWSTOPPER IN THE LITTLE MERMAID. 4. TWO OF JIM HENSON'S KIDS WERE INVOLVED. 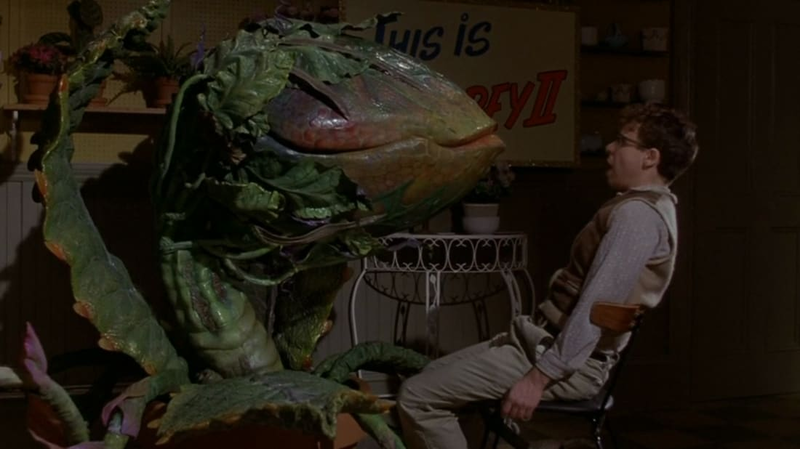 Before Audrey II reaches its full size, the plant sings for some supper in “Feed Me.” On the film’s DVD commentary, Oz notes that Brian Henson—who currently chairs the Jim Henson Company—was the puppet’s main operator throughout this scene. A few minutes later, viewers see his little sister Heather Henson doing a cameo as an abused dental patient. 5. STEVE MARTIN SUSTAINED A MINOR INJURY DURING "FEED ME." When Orin Scrivello, D.D.S. (Martin) and his long-suffering girlfriend Audrey (Ellen Greene) walk up to her apartment, the deranged dentist kicks open the building’s door. On the DVD commentary, Oz mentions that Martin had previously tried opening it by hand only to have the glass unexpectedly shatter, cutting his palm. 6. AUDREY II MADE THE ACTORS TAKE THINGS SLOW. The foam rubber lips on Audrey II couldn’t move fast enough to synch up with the audio during any of his songs. As Oz explains at 4:10 in the above video, the team responded by filming the puppets at a slower-than-average rate of 12 or 16 frames per second, then speeding up the footage to the standard 24 frames per second. Whenever Rick Moranis (who played Seymour Krelborn) or one of the other actors sang side-by-side with the monster, he or she was really lip-syncing in slow motion. “It was a b*tch,” says Oz. 7. BILL MURRAY'S DIALOGUE WAS IMPROVISED. No script? No problem. Murray was invited to portray a giddy, Nicholson-esque masochist opposite Martin’s sadistic character in Little Shop of Horrors. The former SNL cast member took the gig, but asked if he could go off-script. “Look,” Oz told him, “as long as you’re the masochist and Steve’s the sadist, I don’t care.” Murray proceeded to ad-lib his way through the scene, using different lines in every take. 8. A TV-FRIENDLY VERSION OF "MEAN GREEN MOTHER FROM OUTER SPACE" ROCKED THE 1987 ACADEMY AWARDS. Written specifically for the film by Ashman and Menken, this brassy number has power-crazed Audrey II drop a few expletives. “Mean Green Mother from Outer Space” netted an Oscar nomination for Best Original Song, and the plant’s voice actor—R&B legend Levi Stubbs (lead singer of the Four Tops)—was invited to sing it at the ceremony. Obviously, some editing was needed. In the end, Top Gun’s “Take My Breath Away” took home the prize, despite Stubbs’s inspired performance. 9. A SURREAL DREAM SEQUENCE WAS AXED. In the original edit of “The Meek Shall Inherit" segment, Seymour battles his inner demons through a Dalí-esque nightmare that involves bodily transformation, Greek columns, and a bleeding painting. The odd sequence ultimately landed on the cutting room floor. 10. THE ORIGINAL ENDING WAS CUT, TOO. Spoiler alert: In Corman’s The Little Shop of Horrors, Seymour grabs a knife and leaps into the open maw of his dastardly plant, killing them both. The musical wraps up on an even grimmer note: Not only does Audrey II eat all of the principal characters, but the finale reveals that an army of the plant's ravenous offspring has laid waste to cities all across the nation. Oz spent roughly one-fifth of his movie’s budget bringing a version of this apocalyptic conclusion to the silver screen. Completing the elaborate sequence—which referenced Godzilla, War of the Worlds, and countless other sci-fi classics—took just under one year. When Little Shop of Horrors ran its first preview in San Jose, test audiences could barely contain their enthusiasm—at first. “For every musical number,” recalls Oz, “there was applause, they loved it, it was just fantastic … until we killed our two leads. And then the theater became a refrigerator, an ice box. It was awful.” Another screening in Los Angeles provoked a similar reaction. The ending needed a complete overhaul. As Oz told Entertainment Weekly, “We had to cut that ending and make it a happy ending, or a satisfying ending. We didn’t want to, but we understood they couldn’t release it with that kind of a reaction.” Reluctantly, Ashman cooked up a merrier resolution. The discarded ending has since been restored on a 2012 director’s cut DVD. 11. LITTLE SHOP OF HORRORS SPAWNED A SHORT-LIVED CARTOON SERIES. Simply titled Little Shop, the show ran on Fox Kids in 1991. Starring a young Seymour and “Junior,” his rapping prehistoric flytrap, it only lasted for 13 episodes.